Oʻahu ʻĀINA Nutrition Curriculum Training: Saturday, January 19, 2019, 8:30am - 2:00pm, Ala Wai Elementary School. This training will cover the last four lessons of our eight lesson Nutrition Education units. 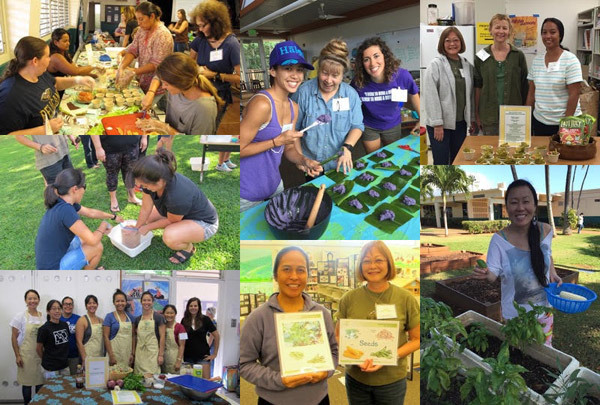 Maui ʻĀINA Garden, Nutrition & Compost Curriculum Training: Saturday, January 26 2019, 9:30am - 3:30pm, Makawao Elementary School. This training will cover the entire ʻĀINA Curriculum. Register for the ʻĀINA Curriculum Trainings for Educators and find more details via this link.